If you are struggling to make ends meet, try creating a bare bones budget. This budget reduces your spending to only the essentials needed to survive. 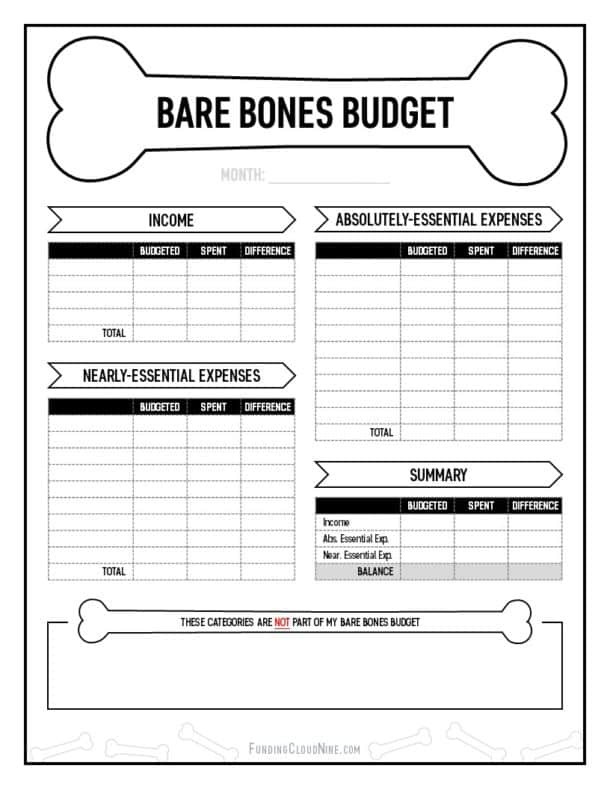 Don’t forget to grab your (free) bare bones budget worksheet below! Everybody has gone through money struggles in their life. It’s a rite of passage into the wonderful world of adulthood. Everybody’s had a need for a bare bones budget, whether they’ve recognized it or not. My moment? I was in college, and I had 6 cents (yep, $0.06….1 nickel and 1 penny) in my bank account. It was nearing the end of the school year so the money I had made the previous summer had run out. I figured if I could walk around the block, look at ground, and double my bank account balance. That’s a pretty depressing feeling. I was lucky enough to have parents who gave me the money to carry me through the last few weeks of the term (and until my summer job started), but money was still very tight. So, I created a Bare Bones Budget. I just needed to make it to my internship when I would start getting a paycheck. If you are in a similar sticky financial situation, then it may be time for a bare bones budget. Read on! What is a Bare Bones Budget? A bare bones budget is a type of budget that identifies the least amount of money you need to spend each month to survive. It only includes your essential expenses. It’s temporary and typically used in special circumstances. How do you know if you should be on a Bare Bones Budget? Basically, you should be on a bare bones budget if you are in a financial situation where you don’t have enough money coming in or you have too much money (expenses) going out. How to Create a Bare Bones Budget? It’s pretty simple to create a bare bones budget. Just follow the 5 simple steps below! I made life pretty easy for you. I’ll email you the Bare Bones Budget template / printable / worksheet (whatever you want to call it) when you enter your email in the box below. Lost your job? Trying to start an emergency fund? Feeling like you can't stop spending? 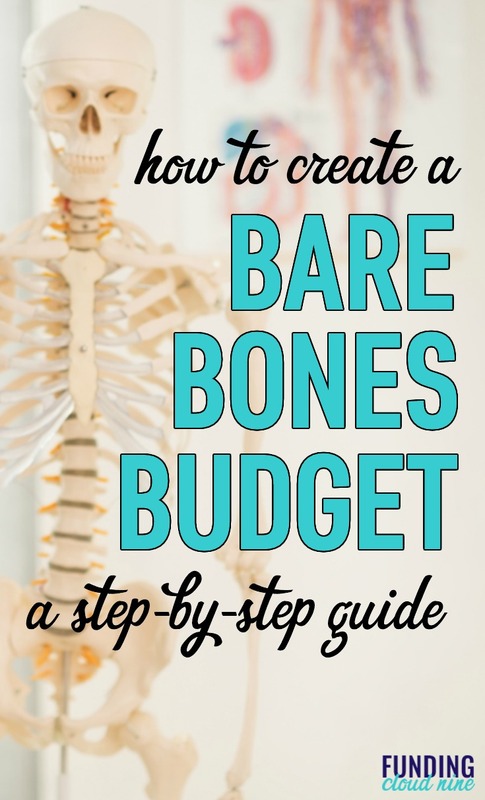 Create a bare bones budget! Everyone should know what it costs to just survive. Success! Check your email to start budgeting! Just like an ordinary budget, you need to know what money you have coming in. List your expected income. Absolutely-essential expenses are those things that you NEED to survive. Everyone needs a place to live (rent/mortgage), a way to keep that place habitable (utilities), food (groceries), and water (duh). There are some cases where absolutely-essential expenses may differ from person to person. Some people may have medications they need to take and that should go into your absolute essentials list. Also, personal preference may cause these expenses to change from person to person. For example, there is no situation that I could think of where I would be caught without insurance. So, for me, insurance is an absolutely-essential expense. Most of these expenses are fixed costs each month – you know exactly what it costs (rent, insurance, medications are the same each month). However, there are a few fluctuating expenses (like groceries and utilities). I suggest reviewing how much you spent in these categories over the last three months, take the average, and set that as your budget. For groceries, I suggest taking 80% of the average (since you’ll be super-frugal on your bare bones budget) and set that as your budget (click here for 50 ways to save money on your groceries). Did you roll your eyes at my ‘absolutely-essential’ list? Heck, I kind of rolled my eyes at it – there’s NO WAY I’d be able to survive on just that list. I mean, sure, if there was a gun held to my head…maybe. Or a situation where I needed to live on that list for a very-very-short time…maybe. But if I wanted to be realistic, there are some other expenses that need to go into my bare bones budget. I’m guessing you feel the same. However, if there’s a situation that I need to cut my expenses even more, this ‘nearly-essential’ list will be the first place I look. And don’t try to sneak in some non-necessities. You have to be honest. If you aren’t being honest, it’s not a bare bones budget. Step 5: Review your ‘absolutely-essential’ and ‘nearly-essential’ lists. Confirm that everything else is a want. Review your ‘absolutely-essential’ and ‘nearly-essential’ lists and confirm that everything on that list is a ‘must-have’ in your life. Nothing on your list can be a want…all should be needs. Something that I find very helpful is creating a list all the things that are wants. On the bare bones budget worksheet that I have provided, there is a box for you to list all of your discretionary spending that won’t be happening when you’re on your bare bones budget. Need more ideas of what to place in this box of things you are NOT budgeting for – check out this list of the first 10 things to cut out of your budget. Creating a budget is easy. But sticking to it – that’s hard. You need to stick to your bare bones budget in order to reduce your expenses until you are in a better financial place. How can you stick to the budget? First off, create one every.single.month. Track every little expense. Hold budget meetings – I suggest weekly meetings if you are on a bare bones budget. Make sure your spouse and family are onboard. Make sure everyone in your family knows why you are on this special budget. How long should you stay on a Bare Bones Budget? A bare bones budget is temporary. You are on this special, no-frills budget because money is tight. It might be tight because you lost a job, you need to build up your emergency savings, you are trying to get your spending under control, or for a myriad of other reasons. Remain on the bare bones budget until you are out of the situation (you got a new job, you fully-funded your emergency fund, etc.). Once you are off the bare bones budget, you still need to create budgets every month (but you can add back in discretionary spending). Should you be on a Bare Bones Budget if you’re in debt? If you are in serious, massive debt (like the student loan situation I had), then it will take you years to pay off your debt. I don’t think it’s feasible or realistic to be on a bare bones budget for years. I wanted some balance in my life, so I was not on a bare bones budget while in debt. However, I was very frugal and questioned each and every discretionary expense <– I’m stretching the truth a little here ;). On the other hand, if you have debt that you think you can pay off within a few months (less than 4 months would be my cut-off point), then I do think you can put yourself on a bare bones budget. Yes, you’ll sacrifice some luxuries during those months you are getting out of debt, but it’s such a short period of time and you’ll always have the end in sight. Now go create your Bare Bones Budget! It’s pretty simple, eh? A bare bones budget is just like any other budget, but without all the discretionary spending categories. But what if you don’t need to live on a bare bones budget at the moment? I suggest you still create a bare bones budget! Trust me, it will be an eye-opening experience. It will force you to distinguish between needs and wants. You may question how much you spend on each needs vs wants – it will certainly put your spending into perspective. Creating a bare bones budget may also help you determine how much you need in your emergency fund. Have you ever been on a bare bones budget? What was the hardest thing you had to give up?